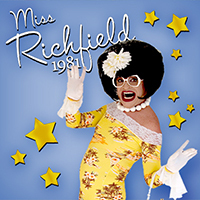 Miss Richfield, See you in Ptown during Carnival!!! Also known as “the baby dolls”!!! See you girls in August! One of my favorite weeks of the year! We’re coming to see you at the Blue Moon in Rehoboth! Can’t wait! I attended your show on June 15th with friends and we loved it. It was so much fun listening to your clean comedy. Thank you for your kind words and support! I do a new show each year, so hope to see you again!